USB Specification: 128MB Memory stick are USB 2.0 Interface and compatible with Windows 7, Windows 8, Vista, XP, 2000, ME, NT Linux and Mac OS,etc. No Drivers Required. The swivel usb flash drive pack with a metal cover design prevent any damage. Key ring allows you to easily hook these 128MB flash disks on to any keychain, making it convenient to carry along! Best for Christmas gifts,Birthday gifts, wedding gifts and advertisement,too. You can store photos and your word on the usb flash drive in computers for friends, family and advertisement. Good gifts for Mom, Dad, Child, friends on Mother's day, Father's Day, Children's day and Christmas Day. 100% RISK-FREE SATISFACTION GUARANTEE, 30-days money back or replacement. USB Size:2.13"*0.76"*0.4" (fold),USB Flash drive requires no setup,you simply plug or store data,Easy to store and Easy to carry. 1, Some capacity not available for data storage. 2, Approximations: results will vary based on file size, resolution, compression, bit rate, content, host device, pre-loaded files and other factors. Convenience- Take it all with you. Sleek and slim design for durability with key ring to prevent loss.Convenient Storage and Portability. Confidence- Focus quality. usb memory stick can offer secure, portable storage that you can trust.Store and share your photos, videos and music in a simple and reliable way. Keep your files safe and secure. Compatibility- USB packs are compatible with USB 2.0 and all types of operating systems. Move data from PC to PC or other consumer electronic devices. 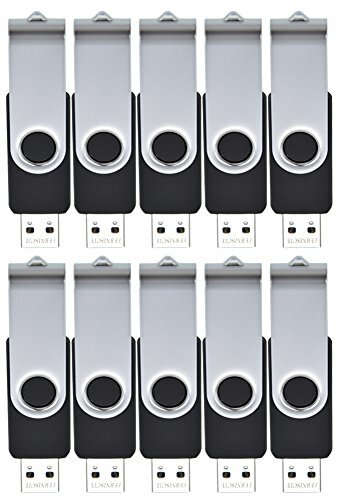 Idealism- Ten 128MB flash drives are designed for Covering and Protecting the USB End by 360° Rotation Metal Side Twist Turn.Allows you to segregate music, documents, movies, pictures ,etc. Fine choice for advertisement- allow to print LOGOs and advertisement. Note - 128MB usb sticks are suitable for storing small files instead of big files. Please confirm the free space you need before buying. If you have any questions about this product by FEBNISCTE, contact us by completing and submitting the form below. If you are looking for a specif part number, please include it with your message.